Eco-friendly materials such as organic fabrics, foams, and woods are becoming popular nowadays due to cleaner lifestyles. People are now more interested in looking for safer mattresses for their kids. Just like organic foods, the reason behind switching to organic home furnishing is for a better and healthier future. One of the best organic crib mattresses that are perfect for your kids is from Naturepedic Verse. This mattress is designed not only for a crib or toddler bed bit for big kids also. It provides a firm support with a soft top quilt that is needed for a growing child. Your child will surely love this healthier and safer mattress and guarantees a good night sleep. 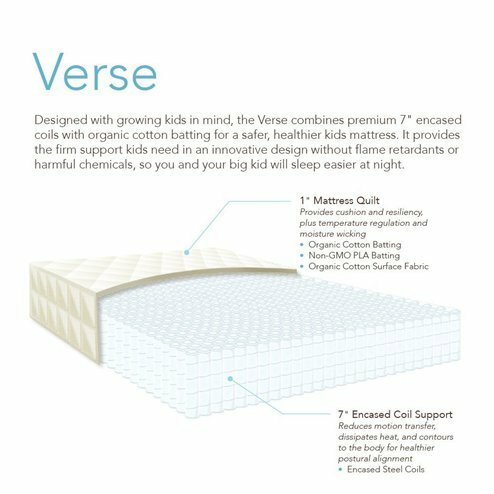 Each Verse mattress is handcrafted with 7 inches encased coils to ensure the comfortability and quality of your child. The encased coils make the mattress more breathable, keeping your child feeling cool. The top quilt is a pure organic cotton which offers a luxurious feel. Naturepedic Verse mattress is shipped in a compressed and roll-packed box for a convenient delivery and setup. The shipping is through ground delivery which only requires a smaller shipping cost. You don’t have to worry about the setup because it includes an easy instruction to assemble that would take just a couple of minutes. Since it is organic, rest assured that there are no harmful chemicals. It is certified safe and non-toxic that pass Global Organic Textile Standard, Greenguard Gold Standard, and UL Formaldehyde Free Standard. Without flame retardants or polyurethane foam, any health or toxicity concerns will not be a problem anymore. 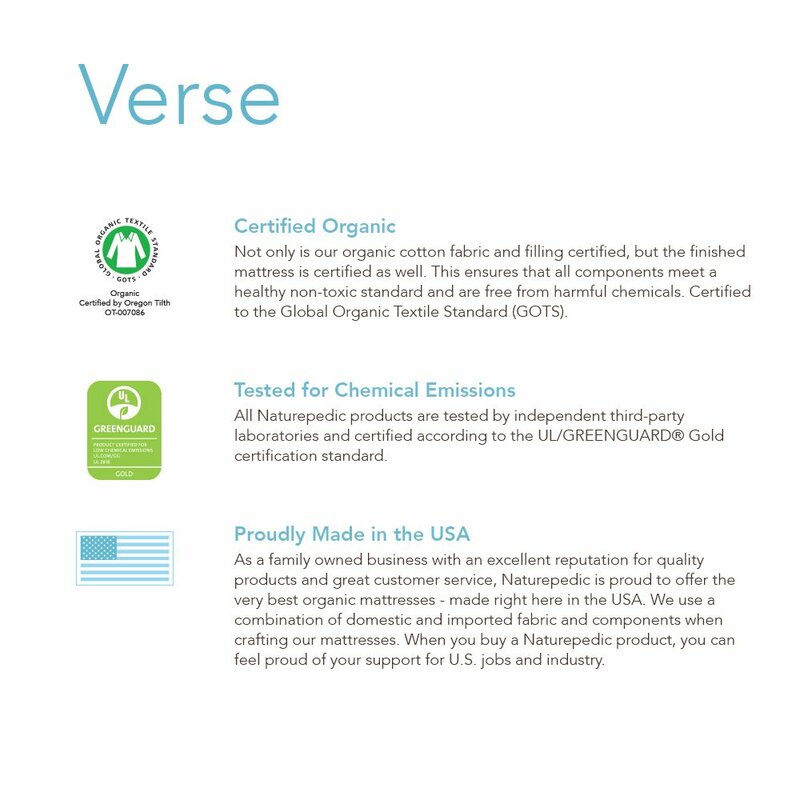 The materials used in the mattress is protected from any harmful chemicals like memory foam, soy foam, and eco-foam. The manufacturer offers a 10-year warranty and provides help with finding the best mattress for your child. Include innerspring beds with several foams and fiber layers, latex mattresses, memory foam beds, and water beds. Include innerspring beds with natural padding and fabric and latex mattresses. Usually made from synthetic materials such as polyurethane foams, vinyl, polyester fabrics, press boards, and other fibers. Usually made from cotton and organic wool for the padding and fabric. Often treated chemicals like dyes, flame retardants, antimicrobials, and adhesives that harm the air and the environment. Foams are made from organic latex tress to create organic latex beds. For most people who are considering organic mattress, aside from comfort, the most important thing that you can have is the safety of your children and the environment. Hypoallergenic Materials – organically-grown latex and wool are hypoallergenic as it is produced with no pesticides and other chemicals treated. Non-Toxic Fire Barrier Methods –passed flammability test because it does not have chemicals like flame retardants, adhesives or glues which cause strong odors and off-gassing. Free of high-VOC Chemicals – tested for VOC levels such as Greenguard, Eco-Institute or Oeko-Tex for safety. Customizable – customers have the ability to choose the firmness levels, and can be made or assemble to order. Sustainable Farming and Manufacturing – sustainable woods, organic cotton and wool, and materials are recyclable or biodegradable to kinder the environment. Nowadays, people are now turning for organic foods, furniture, and materials to help conserve the environment. Natural resources will vanish in a blink of an eye if we forget to take care of them. Mother Nature should be prioritized in able for humans to enjoy a cleaner, greener, and healthier life. Everyone has a responsibility in this world that must be considered in every decision. Choose to live in a safe environment. If you would like to look into cheaper alternatives to this crib mattress, look into our 5 best crib mattress choices.